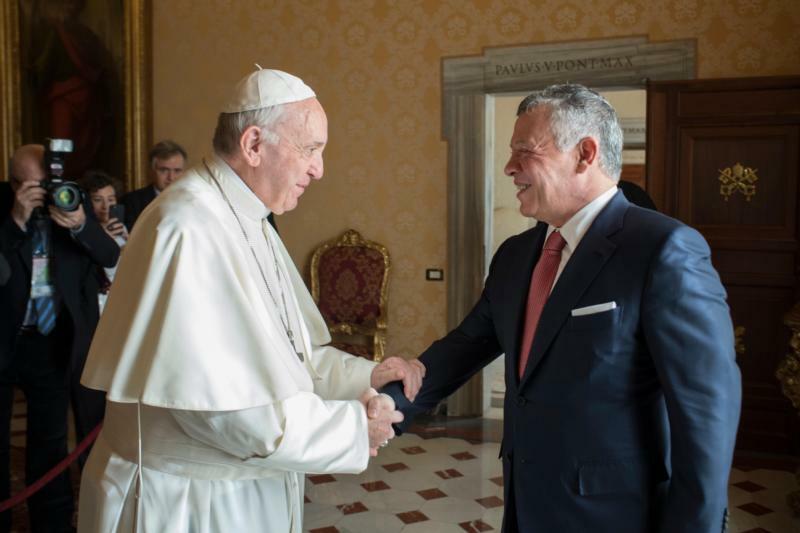 VATICAN CITY (CNS) — Pope Francis met with Jordan’s King Abdullah II at the Vatican, two weeks after U.S. President Donald Trump’s decision to recognize Jerusalem as Israel’s capital provoked outrage in the Middle East. The pope welcomed the king, who was accompanied by Prince Ghazi bin Muhammad bin Talal, in the library of the Apostolic Palace Dec. 19. With the help of an interpreter, Pope Francis spent 20 minutes speaking alone with King Abdullah and Prince Ghazi, an adviser to the king on religious and cultural affairs. After their meeting, the king and his delegation met with Cardinal Pietro Parolin, Vatican secretary of state, and Archbishop Paul Gallagher, Vatican foreign minister. “The king stressed that the U.S. decision violates international law and relevant United Nations resolutions, noting that the status of Jerusalem must be settled within the framework of a comprehensive solution that leads to the establishment of an independent Palestinian state, with East Jerusalem as its capital, living side by side with Israel,” the Jordanian government said. President Trump announced his decision Dec. 6 to move the U.S. embassy to Jerusalem from Tel Aviv, fulfilling a promise he made during his presidential campaign. The announcement sparked anti-U.S. protests throughout Asia and the Middle East and drew warnings from Middle Eastern and European leaders that overturning the United States’ long-standing policy would further complicate peace negotiations. King Abdullah was among several Middle Eastern leaders informed by Trump of his decision prior to the official announcement. According to Reuters, the Jordanian king warned Trump that such a declaration would “have dangerous repercussions” and undermine any peaceful settlement between Israel and Palestine. “Jerusalem is the key to achieving peace and stability in the region and the world,” said a statement Dec. 5 from the Jordanian palace. The Vatican supports a “two-state solution” for the Holy Land, with independence, recognition and secure borders for both Israel and Palestine. It has also called for a special status for Jerusalem, particularly its Old City, in order to protect and guarantee access to the holy sites of Judaism, Christianity and Islam. After the closed-door meeting, King Abdullah introduced his delegation to the pope before exchanging gifts with him. Among the gifts was a painting of the Dome of the Rock and the Church of the Holy Sepulcher, the Jerusalem holy sites for Muslims and Christians, respectively. Jordan is the custodian of Muslim and Christian holy sites in Jerusalem under a 1994 peace treaty with Israel, one of only two treaties Israel has with Arab countries. “The importance of helping Christians remain in the Mideast was brought up and the positive contributions that they bring to the societies of the region, of which they are an integral part,” the Vatican said.